I know this because I had a checklist. I know this because many of my clients had checklists. I know this because I have good friends of mine with checklists of their own. 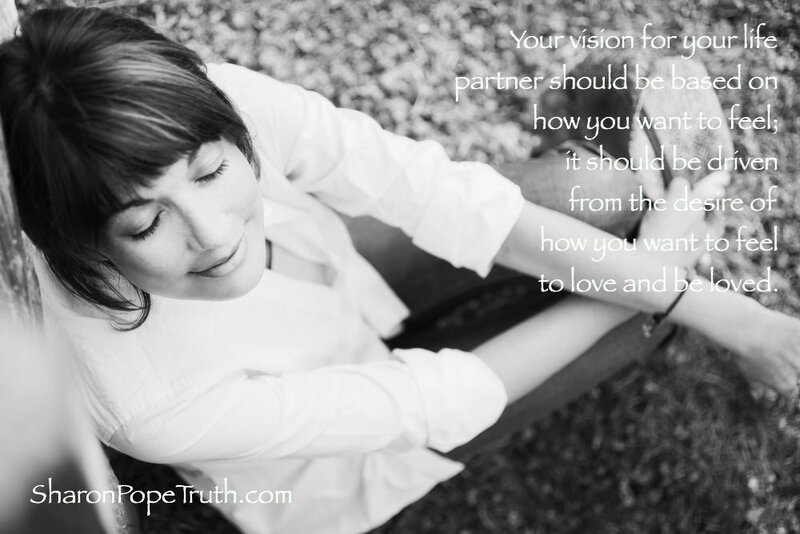 I’m suggesting that your vision for your life partner should be based on how you want to feel; it should be driven from the desire of how you want to feel to love and be loved. These are the questions and the ingredients for a life partner that we should be considering to really meet our desires. What do you want to express and experience? Go beyond the superficial. Go deeper. Go wider. That’s how you create a vision for the love you want. The man who became the great love of my life, my husband, Derrick, didn’t meet some of the superficial boxes I had in my mind at the time I was dating. But I had a very clear understanding of the feeling that I desired in my life and in my heart. And he continues to check all those boxes with ease. PS: If the idea of focusing on the feeling (rather than just the goal) you want to create appeals to you, check out The Desire Map by Danielle LaPorte – she is the master at guiding people to goals with soul. And besides, if you don’t know who she is – you need to!